Home > health > Doctor doesn’t want you to Google your symptoms? 29 May Doctor doesn’t want you to Google your symptoms? I’ve been hearing a lot from Hormonology fans that their doctors are telling them not to search the Internet about their symptoms–aka, consulting “Dr. Google”–to find out the cause of a problem and its possible treatments. I believe this is partially misguided advice: I think it’s wise to do your own research depending on the situation. For instance, if you’re having unexplained pain, a fever, extreme fatigue or another symptom and it’s an issue you never experienced before and/or you can’t pinpoint its cause, then it’s better to consult with a qualified healthcare professional, such as a doctor or nurse practitioner, than to investigate it on the Internet. That’s because this symptom could be due to a wide number of issues and your healthcare provider would know how to accurately pinpoint which one it is and give you the correct treatment. If you try to search the Internet for this new and unexplained symptom on your own, there’s a chance you could misdiagnose yourself (delaying proper treatment or giving yourself the wrong treatment) or you could unnecessarily scare yourself with accounts you read on messageboards and social media. However, if you have an issue that you deal with on a continuing basis and you know the cause or its trigger (such as hormones at certain points in your monthly cycle), then I encourage you to become a member of your own healthcare team and use the Internet to find out more information about it. The trick is to use the Internet wisely. By this, I mean seek out reputable sources, review credentials and double-check information by searching for any studies that back up a blogger’s or article’s claims. You’ll often find links to studies in the blogs or articles themselves (I provide links to studies in my own blog posts). But, you can also search for studies yourself at PubMed.com and ScienceDirect.com. Used the right way, the Internet can be a valuable tool for finding safe, proven alternative treatments for common problems that your healthcare provider might not have time to share, such as using a heating pad, pelvic massage or TENS unit to ease menstrual cramp pain. Plus, it can help you work with your healthcare provider to get better or more comprehensive treatment. That’s because you can bring a study you found that you believe relates to your condition to her or him and ask about it. As an example of this, I had a colleague with painful uterine fibroids who went from doctor to doctor looking for a treatment. Six doctors in a row said her only treatment option was a full hysterectomy. My colleague was in her mid-40s and didn’t want to take such a drastic route. So, off to Dr. #7 she went for another opinion. On the way to that doctor, she read an article about a non-invasive treatment for uterine fibroids called uterine fibroid embolization, which would allow her to keep her uterus and ovaries intact. She put the article in her purse and took it with her. After Dr. #7 informed her that only a full hysterectomy could treat her problem, my colleague took the article out of her purse and asked about the non-invasive procedure. The doctor replied, “Oh yeah, you could do that, too.” She ended up having the non-invasive procedure and keeping her uterus and ovaries. You can see where doing your own research in some situations can come in handy! 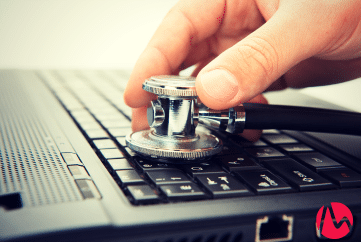 The bottom line: Using the Internet to research health conditions can be beneficial when done for certain conditions, you rely on reputable websites and you double-check what you read. If you’ve got questions, let me know. I’m happy to give you more information about doing your own health research.